Here we believe that not all water is created equal. We are passionate about the fact that water is NOT just water. Unfortunately, many have grown accustomed to consuming subpar, mediocre brands of water which are none the less, city tap water that has undergone “reverse osmosis.” This means that this water has been processed and filtered, thus depleting it of much needed natural minerals. Drinking this water is a disservice to your body as natural minerals are not only healthy for, but vital to our bodies. The source of our spring water is why our competitors pale in comparison. 2T’s high PH and slightly Alkaline balance makes it premium water while delivering key nutrients and oxygen to the body during workouts, daily routines, or high level activities. 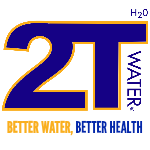 2T Water keeps its natural minerals while other companies transport water from many public municipal sources such as lakes, rivers, sewers, and creeks. You will be pleased to know that our water contains no additives, no demineralization, and has no after taste. Nowadays, there are many enhanced waters on the market which may slightly benefit the body; however, most are still loaded with artificial ingredients which defeat the purpose of being considered “all natural.” The body is comprised of 75% water and research indicates that true water is the only beverage needed to properly hydrate the body and replenish cells without all the extra unhealthy additions. Thus, 2T Water offers you “the true” alternative to processed and filtered water also delicious and with absolutely no after taste. We invite you to experience water at its purest and water at its best.